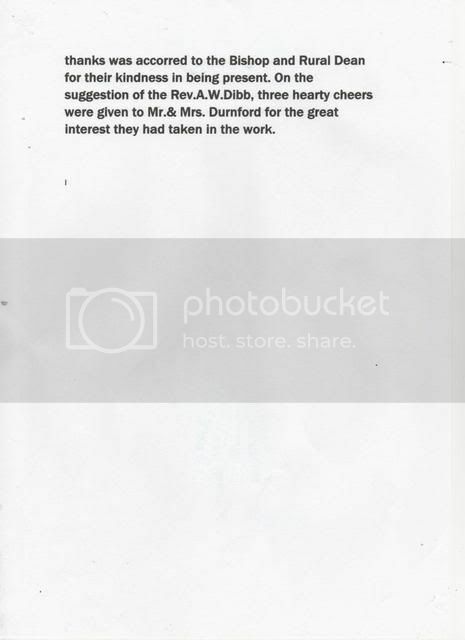 I am luckey to have been asked to help put a clock history together in a book to help raise money for the church. all the research has been done ny Mr Tom Precious who is the present clock keeper. below you will see an account of the opening. this has taken Tom about 5 years to piece together. One if not the greatest treasures of Featherstone is its bells. The history of these goes back and back the more they are looked at. The story starts about 1545 at Nostel Priory. At the time a monastery was on the grounds and within its chapel hung the 3 bells we talk of. They are named ,? ? and? ? They originated from ?? ?bell foundry in London. From here they were eventually taken to all saint church and fitted in 1550. The fitting was paid for by public donation. As so the bells continued to be rung. The next jewel to appear was the clock in 1900. Again money was raised by the locals to pay for a clock. It was ordered from Potts of Leeds. 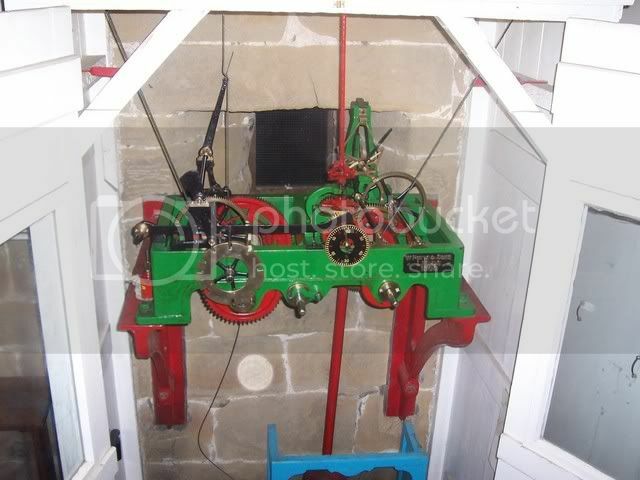 It was delivered to the site in 1900 and installed in the tower bellow the bell room by Potts. The clock was connected to the largest bell ?? to chime each hour. All the bells can and are set to work with the clock. It was first started at 3PM on 1st January 1901. for an average person your first impression is a Victorian steam unit. In every detail it was made to last with a simple but precise mechanism that is fascinating to watch. Watching time go by never looked so good. The clock continued to work for the next 65 years. It was then given a full service and restoration by Tom Precious. From the first day the clock was started it also set off a coin collection. To balance the pendulum old pennies were used as weights. 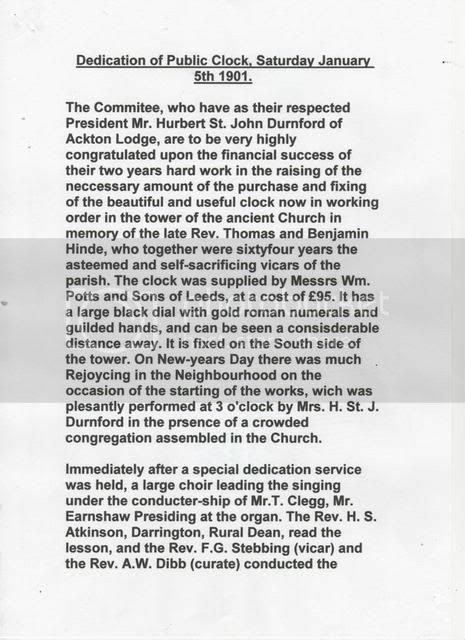 It was agreed in early days by other clock keepers to add another coin per important local event. The first penny is 1900 the year the clock arrived. The second 1901 the year it started and on and on. Tom then continued to the present day to look over our jewels. For over 40 years Tom has looked after this clock, winding it each week at taking care. In 1976 in was discovered that the huge oak woodwork frame around the bells and holding them was rotten. It was going to be a huge task at great expense to make the bells safe from falling let alone repair the woodwork and refit them. Along came Mr Ozzy Wilks. Ozzy saved our jewels in so many ways I hope you he is important to Featherstone history as Tom. Ozzy tuned up and said he would pay for the repair. The bells were taken down and carefully looked at for the first time in many years. A manufacturer still existed in London called Whitechapel’s. They were contacted. Bells on the top of them are normally flat. These bells had what you call a crown on top. In English to look at them it looks like someone has cast the queen’s crown on the top. This was used in very early bells to hang them. It was agreed for Ozzy to take them down to London on his wagon, probably the same one he has delivered numerous steels to me with. When he arrived he explained the history to the bell makers. He also described the plan to cut of the crowns. On the spot Whitechapel’s applied for a preservation order explaining the bells were some of the oldest and rarest in the country. To find crowns still intact is very rare. A history of the bells was calculated. The largest bell was the oldest. This could be found from the pitting on the outside. This was due to the mould not being hot enough. An early bell before knowledge was gained in casting bells. The other 2 smaller bells were about 40 years older. The original date of cast was given at 1410. The bells were brought back to Featherstone with a new Japanese oak timber frame that had been built. Japanese oak was used because it is more moist and resilient to beetles and other insects. The huge frame was installed into the tower with the bells. Ozzy then expressed an interest in adding another bell. The frame and space could hold 2 more bells. The frame is even carved and notched to ad another timber frame. Ozzy had by now spent £7800. In 1976 you could buy 2 houses in Featherstone. The vicar said to stop as he had given enough. 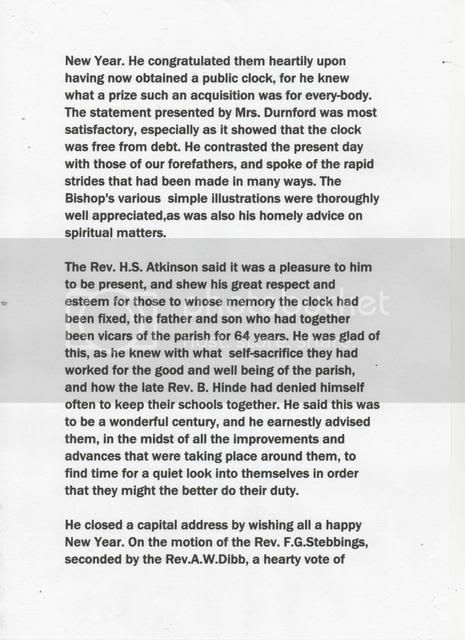 The bells rang again as the clock was re-started at 3PM on January 1st 1977. Ozzys name and Whitechapel’s is carved into the frame. 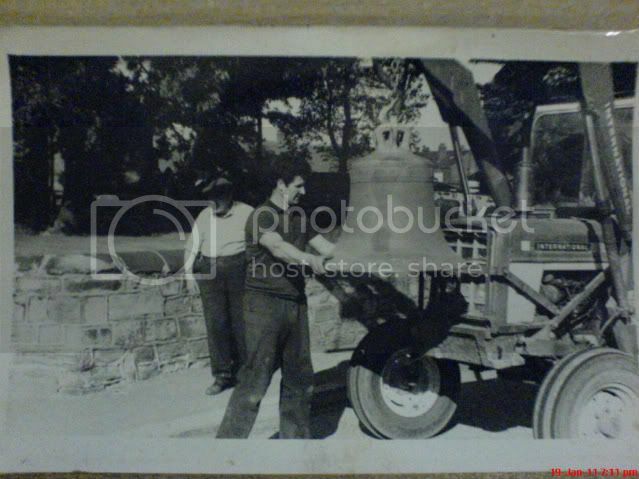 Tom continued to maintain our clock without much interruption until 2004 when the vicar put forward plans to remove the clock and bells and put in a mobile phone mast. The idea thankfully fell through due to pressure from locals and Tom. Our clock also nearly became famous. Tom was a friend of the late and great Fred Dibner. Just before Fred’s last TV series it was agreed that Fred and Tom work together and produce 2 programmes about our local clocks. Sadly as you know Fred has now left us. What he pointed out and saved, lives on in Tom and hopefully in others for years to come. You would think 1 clock with such a history in a small town would be enough. Well we have got 2.
when I was doinmg my nurse training I looked after Ossie's brother: Buck. i had to ask what was the john gulley book? now that would make a great film. Came across this picture today. In my opinion it is and could be one of the greatest Featherstone moments captured on film. I could let you try and work it out but the detail is just too Featherstonely interesting. What you can see is Ken Still steadying a brass church bell. 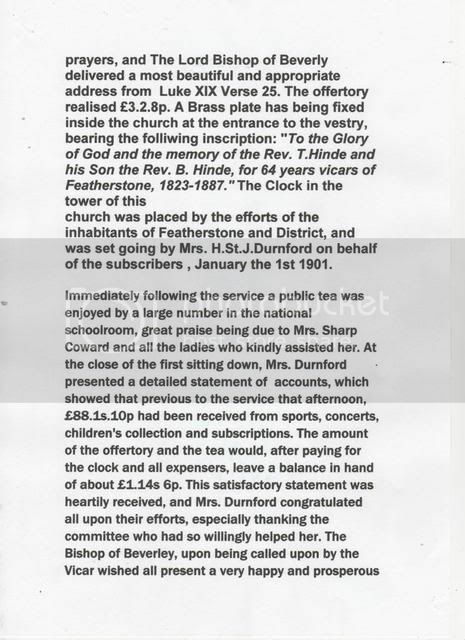 The bell had been removed from North Featherstone church along with 2 others and sent away to London to be re-tuned and serviced. This is the same bell that about 1501 3 monks from Nostel Priory took down from the Nostel Priory monastery and brought to Featherstone for safe keeping at the cross roads Farm now owned by the Huff family. The tractor you see was Kens and still is. Ironically it should be up and working again this week. The chain holding the bell complete with hook is sat on the driver’s seat. Whilst the bells were out of the church tower the oak woodwork was repaired and replaced. This was mainly funded by Ozzy Wilks. The same Ozzy that carried the sack of coal on his back from the Top House to the Bull Ring in Wakefield and back for a bet. Ozzy is stood in the back ground.